Exclusive Custom Home in Formosa Gardens. This exquisite home offers a truly luxurious experience from the moment you step through the door. Top quality finishes, furniture and equipment provide you with every home comfort to make your stay a memorable one. With 7 bedrooms and 7 bathrooms, including 5 en-suite, plus three distinct living areas, even large groups can be accommodated wihout sacrificing personal space. Located within an upscale gated community, this home is perfectly located for all Central Florida's attractions, a huge range of restaurants, shops, golf, fishing and other sporting activities. The generous living spaces feature ample seating for large groups with leather sofas throughout and mealtimes are no issue with both a formal dining room that seats 12 in comfort and more informal dining options in the nook next to the kitchen. The kitchen features state of the art GE appliances for the chefs amongst you and has every conceivable appliance, pot and pan you might need to cook up your next culinary masterpiece. A separate study is equipped with a state of the art touch screen PC, high speed internet access and multi function printer/scanner to keep you connected whilst away from home. All bathrooms are tiled full height in luxury ceramics and feature wall hung vanity units, twin basins to the master suites and deep soaking tubs or powerful showers. The home offers 4 spacious Master Suites with King sized beds, designer bathrooms and luxurious linens. A further bedroom suite offers a Queen sized bed and private, luxury bathroom. The Princesses in your party will fall in love with the Palace Suite and its themed pink decor. Lastly, for the boys, a comfy bunk room completes the bedroom line up. The latest in home technology is at the focus of the home with large flat screen TVs & DVD players in all the bedrooms and living spaces as well as a whole house audio system with multiple sources (including an iPod dock) that allows different zones to listen to different music sources simultaneously. We also have the top cable package installed throughout the home. For those of you that need to stay connected whilst away from home or just enjoy surfing the net, we have provided a Sony touch-screen PC for your use with complimentary high speed Internet access and WiFi connectivity throughout the home. A multi-function printer, scanner & fax machine completes the lineup. Touch-screen panels throughout the home allow guests to control lighting, security and audio at the touch of a button. This is the perfect base for families with children – All ages from babies to toddlers to teenagers are well catered for and you can be confident that everything you need for a stress free vacation is at hand. For our youngest guests we have two full size cribs, two strollers, high chairs, baby monitors, bottle sterilizers & a range of ‘first toys’ are available with our compliments.Toddlers and younger children will love the Little Tikes playhouse located on the pool deck which provides hours of fun as well as a comprehensive range of soft toys and games suitable for their age (Lego, mega blocks, dolls, & action figures to name but a few). For older children & teenagers the home theatre & games zone proves a real hit but we also have a large range of board games and of course the PS3 & Nintendo Wii to keep them occupied. Last but by no means least, the private cinema with its extensive film library, offers a great place to kick back and relax at the end of a busy day. Just alongside the cinema, the games arcade will keep the competitive in your party amused for hours. Enjoy Florida outdoor living at its finest on the expansive deck an pool area. Whether for alfresco dining, a refreshing swim, relaxing spa session or enjoying the outdoor pool table, there is something here for each and every member of your group. By night this area transforms through the use of fibre optic lighting creating a stunning ambience for entertaining. Within one mile you will find over a dozen restaurants (including TGI Fridays & the Outback Steakhouse), a large supermarket and several specialty shops at Formosa Gardens Plaza. You can take a leisurely stroll and be at your restaurant of choice in about 15 minutes or jump in the car and be there in two! 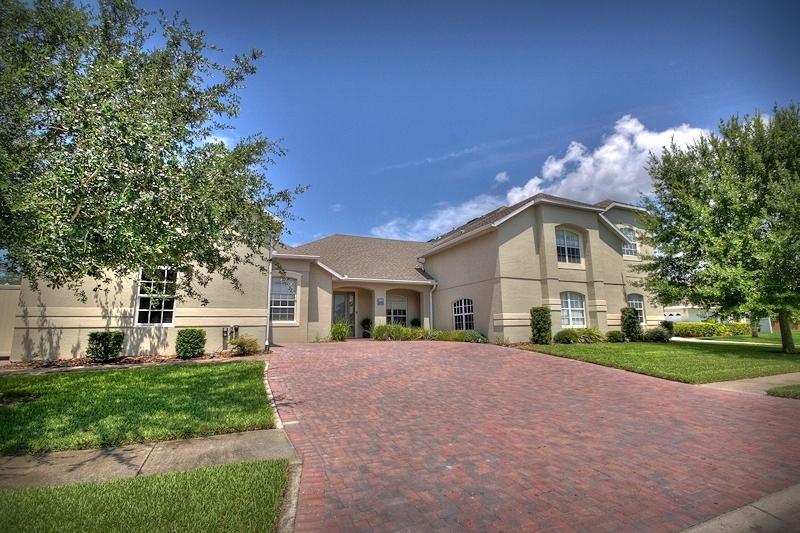 Formosa Gardens is perfectly located for all the major attractions of Central Florida. Walt Disney World Resort is located just 3 miles away, with Universal Studios just 17 miles (20 minutes) away. Busch Gardens and the Kennedy Space Centre are approximately 1 hours drive away.